Jeju United have finished one of their best ever seasons by gaining qualification into next year's AFC Champions League. Their Nov. 1 draw against Ulsan Hyundai saw them get the required points with one game to spare. Jeju are three points ahead of the fourth placed team, but the fact that they have scored 28 more goals means they are all but guaranteed to finish in third position. This is the first time Jeju have reached the champions league since 2010 when they finished second and only the second time since 2006 when Bucheon SK became Jeju United. After a good start to the season, a poor run of form over summer saw them momentarily drop out of the top half. At this point, their aim of finishing in the top three looked to be in serious doubt. However, since mid-August Jeju United have been on an incredible run during which time they only lost one game in eleven. This saw them soar up the table into third position. In the K-League the top three teams and the winner of the KFA cup gain champions league qualification. The game that saw them clinch third was played against Ulsan, who were also their main competitors for third place. In fact, an Ulsan win in this game would have meant Jeju going into the final game of the season needing to get at least a point against army team Sangju Sangmu. The big occasion didn’t get to them though. Jeju put in an excellent performance that showed off the improved defensive solidity that has been a big factor in their recent form. In fact, in the end, Jeju were unlucky not to have won. They went close to scoring on a number of occasions, including a wonderful curling free kick from Brazilian attacker Marcelo. Despite the celebrations last night, Jeju United do still have one game remaining. While their position in third is confirmed, the players will no doubt want to end the season on a high. Despite losing some key players over the transfer window, Jeju United showed their ambitions for the season by signing forward Lee Keun-ho. He quickly showed how important he would prove to be for the team by scoring on his debut against Seongnam. Signed over the winter break from Ulsan, 21-year-old Ahn Hyun-beom made his first start for Jeju against Sangju Sangmu. Despite his youth and relative inexperience, he slotted straight into the team and scored two goals that showed the fearsome blend of pace, power and directness that has made him such a handful for opposition defences. His form would continue throughout the season and with one game remaining, he has seven goals and four assists. He has also just been named as one of three players nominated for the K-League young player of the year award. In one of the most thrilling games of the season, Jeju United scored three late goals to come from behind and beat FC Seoul 3-4 in their own back yard. This was during a good run of form that saw them reach third position in the league for the first time in the season. While a 1-0 win against relegation threatened Incheon may not seem like much, it was the circumstances of the win that were most impressive. Prior to this game, Jeju had only won three games in thirteen and had been leaking goals. However, the tactical switch to a back three and the more cautious style seen in this game was the start of a nine-match unbeaten run that saw them concede only nine goals. After not scoring despite being the better team for most of the game, Jeju United fans could have been forgiven for thinking it wasn’t going to be their day against fellow Champions League spot contenders Jeonnam Dragons. That is until Lee Chang-min (signed from Jeonnam during the pre-season) picked the ball up just inside the opposition's half, took a touch, and then smashed it straight into the top right corner. Rarely has a ball been hit with such a perfect blend of power and precision. Even with their improved form, not many people would have thought Jeju could get a win against league leaders Jeonbuk Motors. Up until this point, Jeonbuk’s expensively assembled squad of K-League superstars were unbeaten in the league. What is more, only two weeks previously they saw their huge lead at the top of the league cut due to a nine-point punishment from the KFA. This meant Jeonbuk were also in real need of a win to keep the gap between them and second place. However, a thrilling atacking performance and another late goal saw Jeju beat the league leaders and Champions League finalists to give themselves a real chance of finishing third. Needing just a point from this game to confirm Champions League qualification. 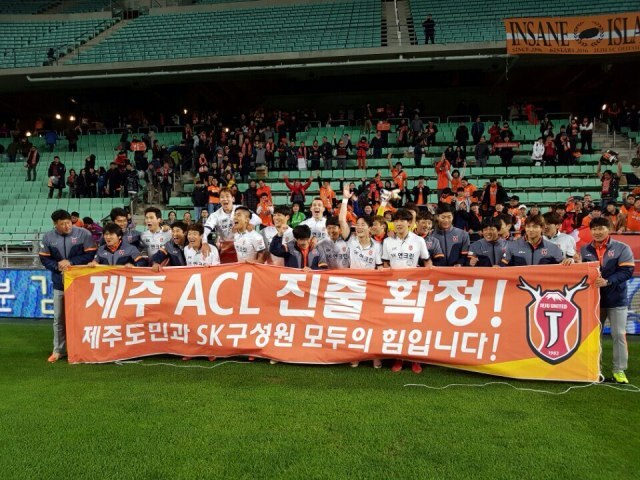 Jeju shut out Ulsan to get the required result and confirm they will enter the AFC Champions league next season!